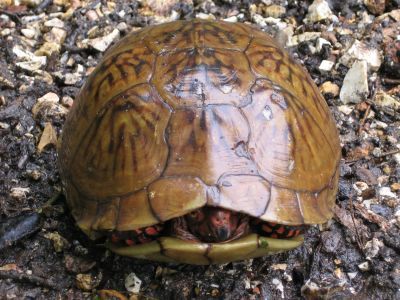 Farmgirl Fare: Daily Farm Photo 6/15/06: Peek-a-Boo, I See You Turtle! Daily Farm Photo 6/15/06: Peek-a-Boo, I See You Turtle! Yes, all of you who guessed that yesterday's Daily Farm Photo was of mulberries are absolutely correct. And thanks for all the great mulberry stories. I had never seen a mulberry until I moved to this farm, where we are lucky to have several mulberry trees scattered around the hayfield. They don't put on berries every year, and the first time Joe showed me some ripe berries (while we were putting up hay) several years ago, they were so high up in the tree we could barely reach them even when standing on the back of the flatbed pickup truck. This year Cary and I were hot and sweaty and tired and achy and on the verge of quitting The Haying Crew (for the first of several times), when Joe ordered us to stop picking up hay bales and follow him. He led us to a smaller mulberry tree that was so loaded with low-growing, perfectly ripe berries that I immediately lasped into some kind of picking and eating trance because before I knew it, several minutes had passed, I had this sudden feeling I should stop eating berries, and my lips, fingers, and clothes were all purple. Cary preferred nibbling on the lush clover growing in the shade beneath the trees. Apparently there are many different varieties of mulberry trees, and the taste of the fruit varies widely. We seem to have one of the yummy varieties. While the other trees had hardly any fruit on them this year, that smaller one probably has enough to make a pie. But if I hike back out there and start picking, I have a feeling very few berries will actually make it into the bucket. Click here to learn more than you ever wanted to know about mulberries. If you're wondering about what the turtle has to do with all of this, click here to read my post about Turtles & Strawberries (not a recipe) that appeared last month on my kitchen garden blog. I was going to re-post it on Farmgirl Fare due to popular demand (okay, okay, my mother told me I should because it was so cute), but I think a link to it should suffice. Though I guess now I should beg you to leave comments on that post so my mom will know that you really did go take a look. SUCH a cute turtle! And I never would have guessed .. though it makes sense to me now .. that turtles would eat strawberries. Oh! Do you have a problem with Japanese beetles at all? If so .. how do you deal with them? CONGRATULATIONS ,YOU HAVE A NICE BLOG. Hey! You're in Missouri...and I was raised among all this wonderful farmland :) I actually did the opposite. I moved away from the small town and now I live smack-dab in the middle of St. Louis! i like your blog..enjoy your pictures and words.. I read the "turtle and strawberries" story when it was first posted, then read it again today. I agree with you...it is very cute. Thank you for raising such an entertaining daughter! Hi Susan's mom. Back in the forties, my mother had four little ones who walked around with purple mouths and hands until mulberry season was over. And, we always had a least one "pet" turtle. Looks like our kids never grow up. Your blog is lovely. Organized, easy and interesting to read, visually stunning and...just beautiful. Is your house all of these things too? Sometimes in the morning I feel like that turtle. Hi ! I rescued a long neck turtle before. I am a Hero .